LEARN HOW TO PUT ON LEAN MASS, MAKE STRENGTH GAINS, AND GROW! Are you ready to start building muscle and changing your body, but don’t know how to develop a consistent plan? This program is for you! The 12 Week Beginner Bulk Program was developed to help teach people how to train consistently and make gradual gains that lead to long term muscle growth, strength, and quality. 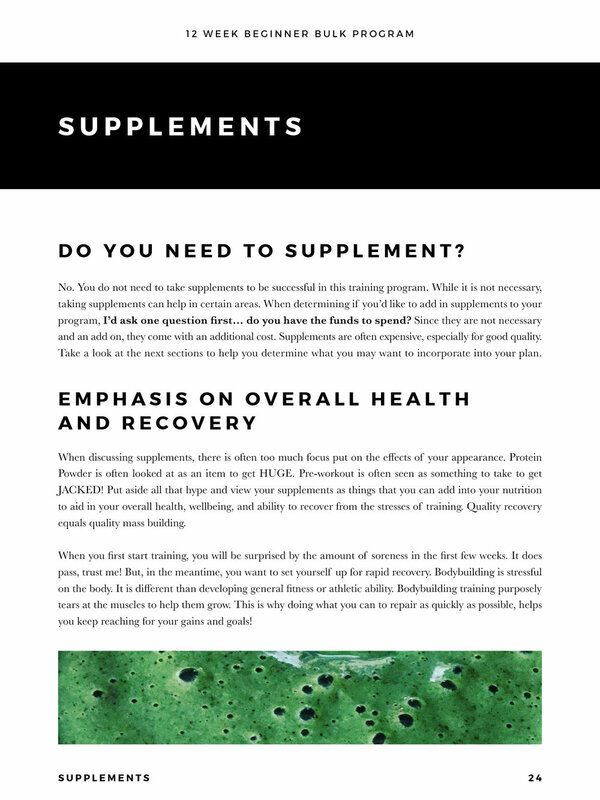 The PDF eBook totals over 130 pages of content and contains all the information you need to get started and help you along during your 12 weeks of training. The methods in the program are what have allowed me to gain over 50lbs in less than 2 years while staying at relatively the same body fat percentage. Following the program, you can expect to make gains in muscle mass and strength that are at consistent and even intervals. This ensures that you are gaining healthy weight and lean mass. Who is this program for: The 12 Week Beginner Bulk is for anyone who want to learn how to put on muscle and size. 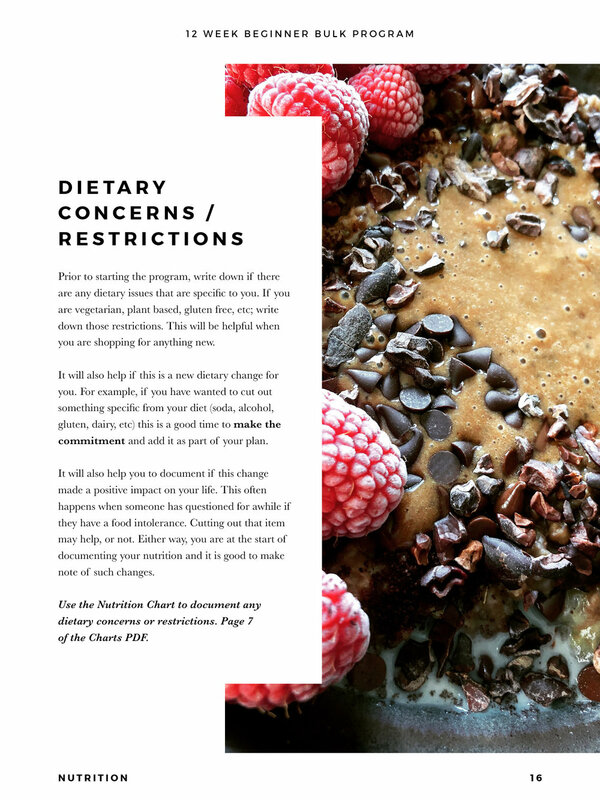 It is specifically designed for someone who has never done a training program before or tracked their nutrition. What the program includes: Goal setting tools, how to document your progress, how to adjust your training and nutrition to keep growing, how to set up macros and track them, how to train, 12 week evaluation, ALL workouts, and more. 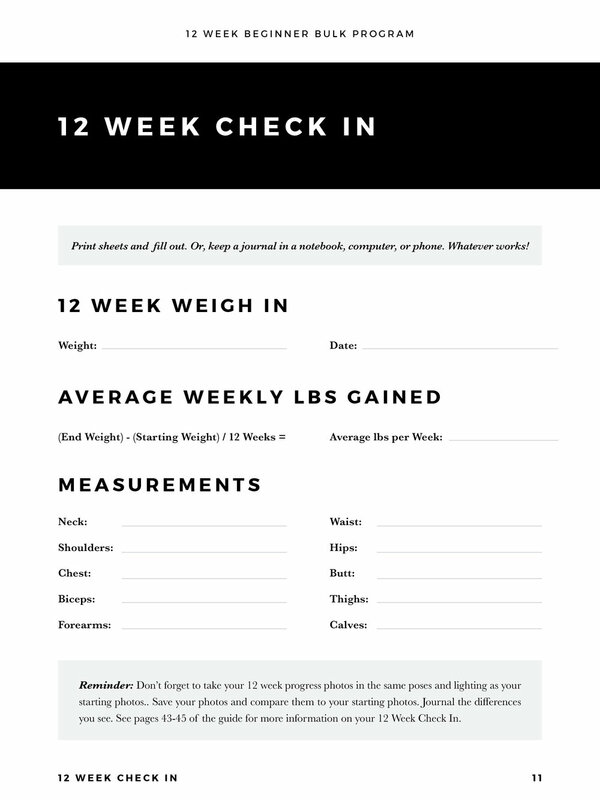 What you can expect to achieve: If you follow the program training and nutrition, you can expect to have gained 1-1.5 per week at the end of 12 weeks. Within that time you will have developed consistency, dedication, an understanding of compound and isolation exercises, how to properly fatigue your muscles, adjust macros, set goals, and more! What equipment you’ll need: This plan is best followed with access to a gym that has free barbells or a smith rack, dumbbells, cables, and machines. If you do not have access to some of those things, not to worry! I have a full list of substitute exercises to help you. How to use: Click through the eBook quickly using the interactive table of contents provided for each section of the program. There are also several links to help quickly navigate the eBook, these are shown in blue.